Another coworker I will always remember is Celina Benavides, whose beautiful name befits her beautiful person. This is my tribute to Celina, a native of El Salvador. “Let’s get pupusas,” Celina says. “I’ve heard of those. What are they?” I ask. 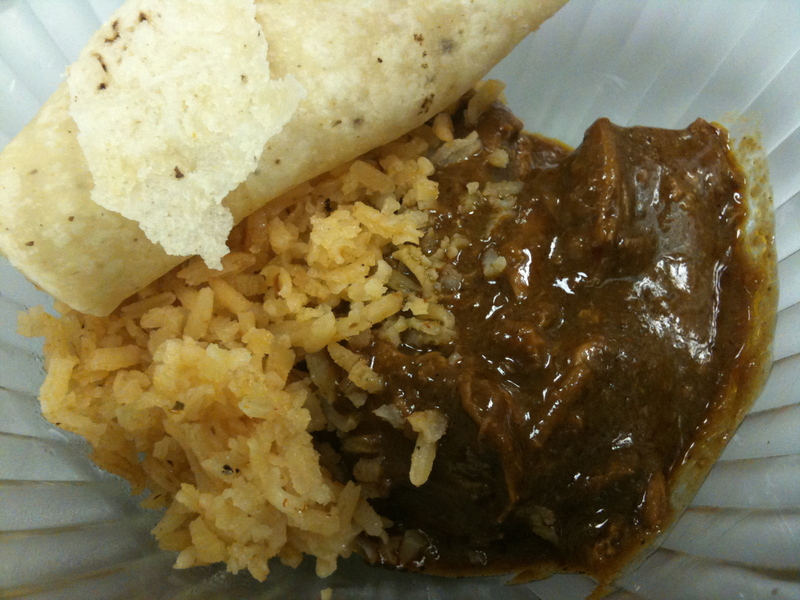 “They are made of masa and then fried like a tortilla. Yeah, they’re sort of like thick tortillas,” adds Sylvia, helpfully. “So they’re chewy and dry like a tortilla?” I press. “No, not quite,” is the reply. “So they’re thick and chewy like flat bread?” I try again. “What do you eat them with?” I ask. Persistence pays off, I tell you. True to her word, Celina rushed into the office a few days later, arms laden with fragrant bundles. Each pupusa is about ¼” thick and is filled with cheese, refried beans, chicharrones (fried pork skin), or some combination of the three. 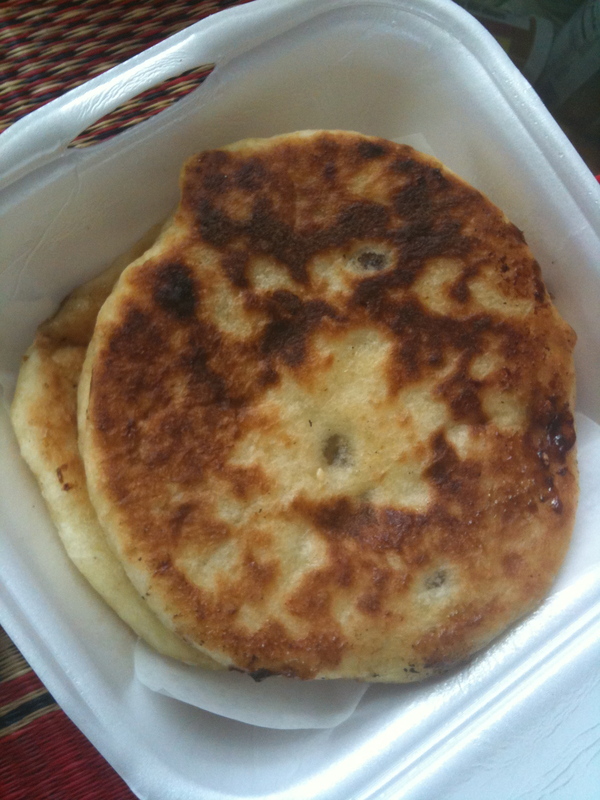 Pupusas are like fried tamales, soft and mushy with sharply salty center. They are topped with curditas and a thin tomato sauce, almost like a very mild salsa. They are more like Chinese pickled cabbage than like Korean kimchi — lightly marinated, freshly pickled and made with the normal cabbage rather than napa. 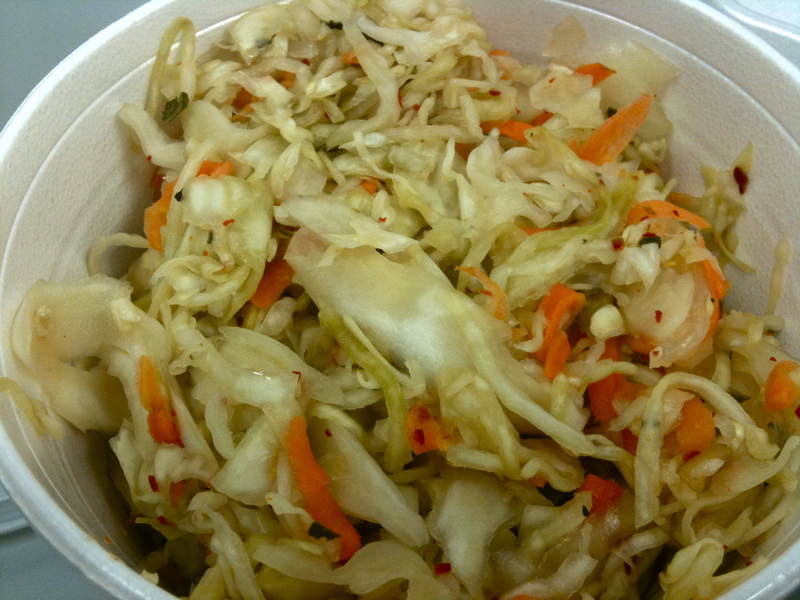 I tasted vinegar, red chili flakes, cabbage, carrots and onion. My coworker noticed oregano. Other than the oregano, the similarity to Chinese pickled cabbage is striking. 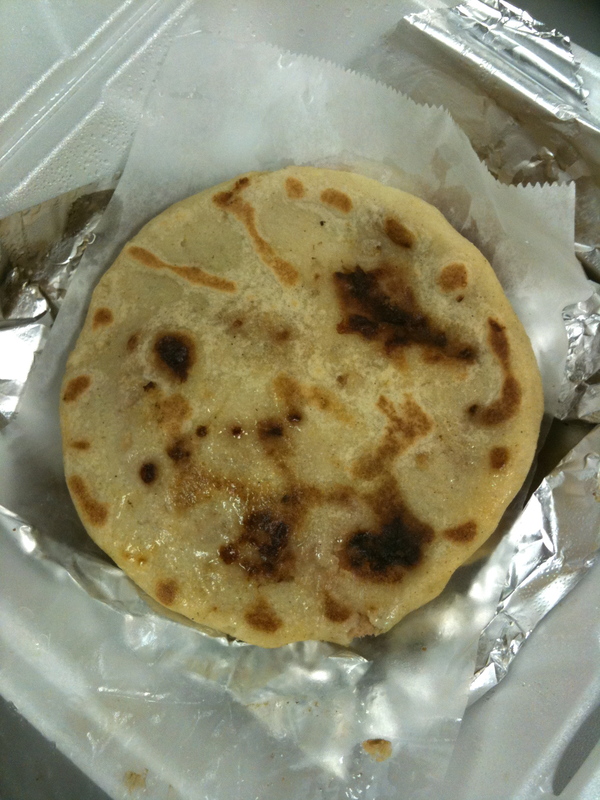 Another similarity between pupusas and the food I grew up with is the pupusa itself. Consider the two pictures below. The photo on the right is of ho dduk, my father’s favorite Korean street food, a fried cake made of sticky rice and filled with cinnamon, sugar and nuts. The photo on the left is the pupusa, a cake made of white cornmeal and filled with savory items instead. Food knows no boundaries, be they geographical, national, political or ideological. I made some cupcakes this week and turned to my most trusted references for help. Billy’s Vanilla, Vanilla Cupcake recipe, found here, is interesting in that you cut the butter into the dry ingredients and then add the wet ingredients. Most cake recipes require 5 minutes of creaming butter and sugar, but Billy’s technique is reminiscent of scones, soda bread and biscuit. I like it because you do not need to leave the butter out to soften as the butter warms when cubed. I also like that some cupcakes get actual chunks of butter. I modified the original recipe by decreasing the sugar and increasing the vanilla. Overall, they had a cake-like texture similar to teacakes, very different from the chocolate cupcakes below. 1. Preheat oven to 325°. Line cupcake pans with paper liners; set aside. In the bowl of an electric mixer fitted with the paddle attachment, combine flours, sugar, baking powder, and salt; mix on low speed until combined. Add butter, mixing until just coated with flour. 3. Divide batter evenly among liners, filling about two-thirds full. Bake, rotating pan halfway through, until a cake tester inserted in the center comes out clean, 17 to 20 minutes. 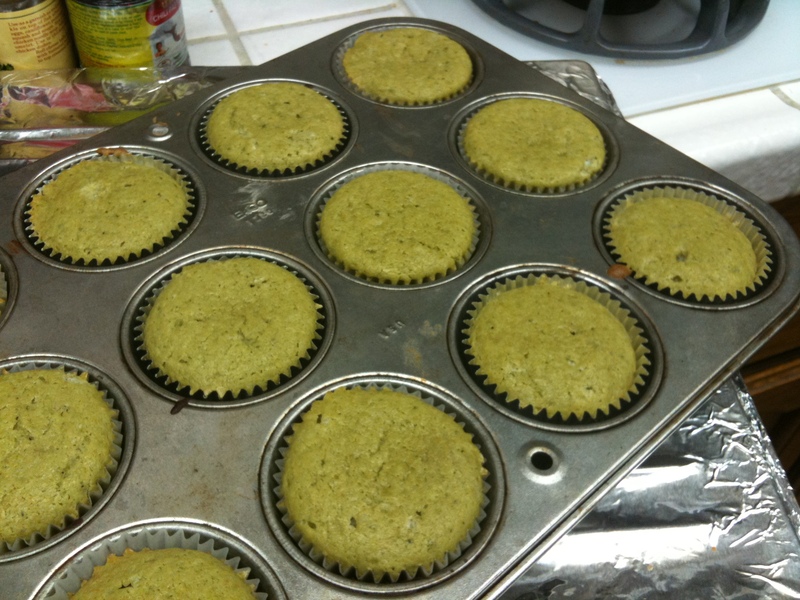 I also made some matcha cupcakes by substituting 2 tablespoons matcha powder for the vanilla extract in Billy’s Vanilla, Vanilla Cupcakes. These were everyone’s favorite by far. I would, however, like to experiment with a softer green tea cupcake with a more tender crumb, similar to the moister chocolate recipe below. 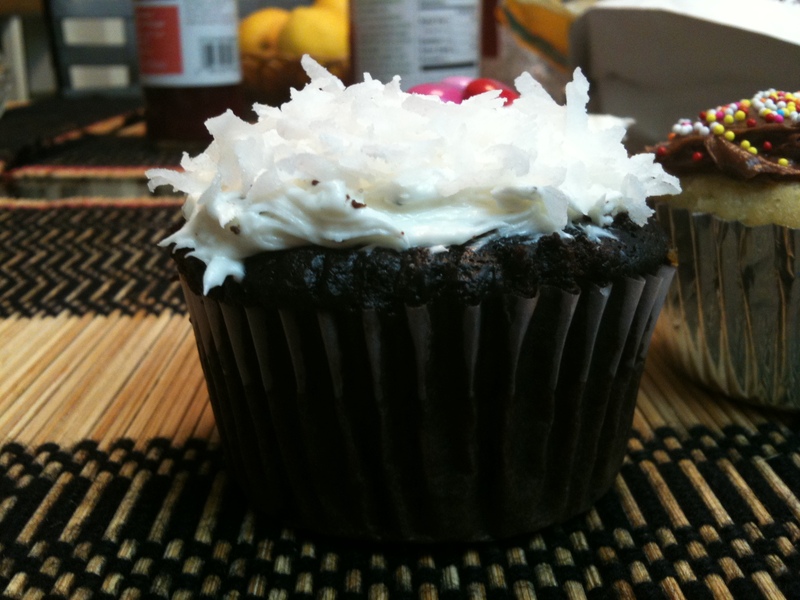 These cupcakes were decadent with an intense chocolate flavor, but I found them too salty. I modified the original recipe by decreasing the sugar and the salt. Preheat oven to 300 degrees. 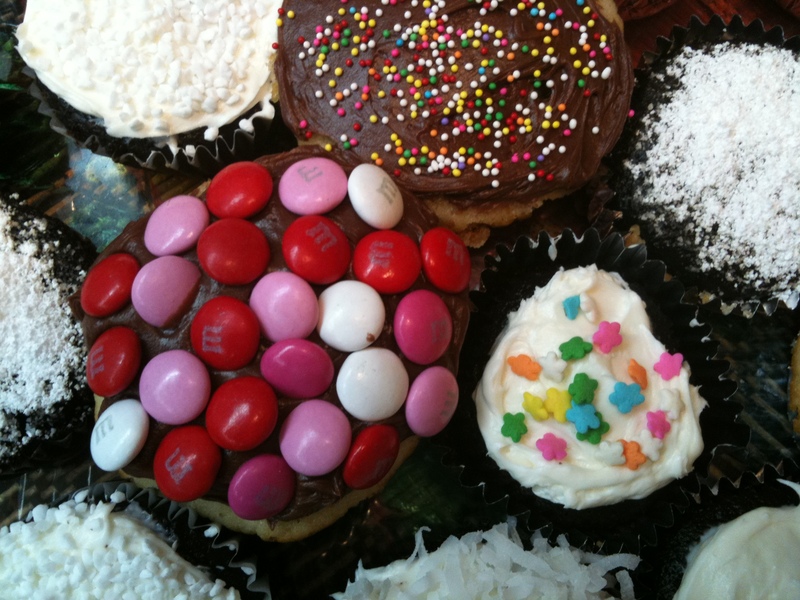 Line cupcake wells with fluted paper liners or butter cake pans and line with parchment paper. Sift together sugar, flour, cocoa powder, baking soda, baking powder, and salt into a large bowl. In another large bowl, beat eggs with an electric mixer until thickened slightly and lemon-colored (about 3 minutes with a standing mixer or 5 minutes with a hand-held mixer). Slowly add oil, buttermilk, vanilla, and melted chocolate mixture to eggs, beating until combined well. Add sugar mixture and beat on medium speed, bracing yourself against puffs of cocoa-and-flour dust, until just combined well. Divide batter between pans. Bake in middle of oven 20 to 25 minutes for cupcakes, or 50 to 70 minutes for larger cakes, until a tester inserted in center comes out clean. Cool cakes completely in pans on racks. 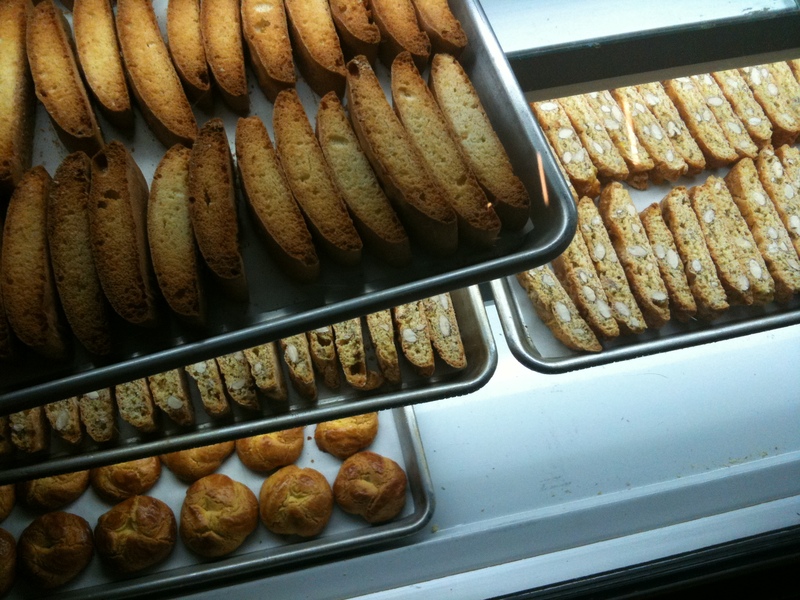 Run a thin knife around edges of pans and remove cupcakes, or invert larger cakes onto racks. If making larger cakes, carefully remove wax paper. Cakes may be made one day ahead and kept, wrapped well in plastic wrap, at room temperature. These jewel-like beauties were made by my dear friend Julia, the one who introduced me to mochi cake, Berkeley Bowl, Naan ‘n Curry, and the world of good eats in general. Graced with an eye for beauty as well as a discerning palate, she is the inspiration for many of my edible projects. This recipe for Broken Glass Jello, which I prefer to call Stained Glass Jello, comes from here. 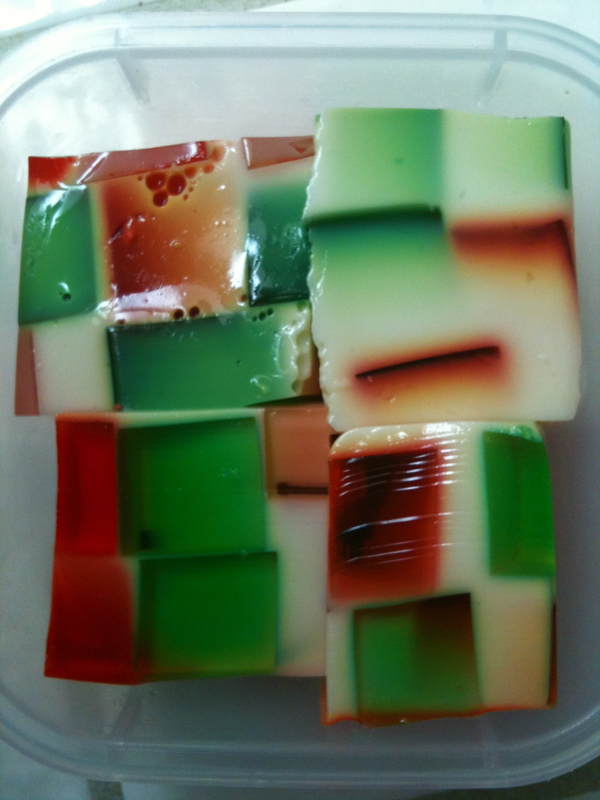 When firm, cut each batch of jello into small blocks. Carefully mix the blocks in a 9 x 13 pan. Sprinkle Knox gelatin over 1/2 cup cold water. Once the gelatin blooms, add 1 1/2 cups boiling water to fully dissolve the gelatin. Add the condensed milk, stir and cool. 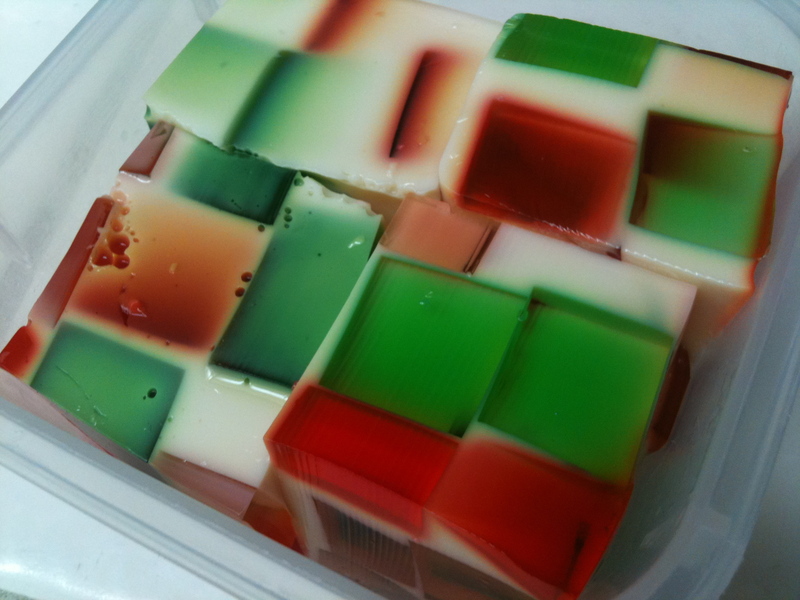 Pour the condensed milk mixture over jello cubes and chill overnight. Note: Julia said she would double the condensed milk later next time as we all felt there was not enough of the precious creamy gelatin. Preheat the oven to 180° C (350° F), line the bottom of a round 25-cm (10-inch) cake pan with parchment paper and grease the sides. In a large mixing-bowl, gently combine the yogurt, eggs, sugar, vanilla, oil, and rum. In another bowl, sift together the flour and baking powder. Add the flour mixture into the yogurt mixture, and blend together — don’t overwork the dough. Pour the batter into the prepared cake pan, and bake for 30 to 35 minutes, until the top is golden brown and a cake tester comes out clean. Let stand for ten minutes, and transfer onto a rack to cool. Courtesy of this beautiful blog. I use 1/2 brown sugar, plain nonfat yogurt, and add any fruit I have on hand. I serve it warm with more yogurt or vanilla ice cream.